How exciting my tech life is these days. I created a new website, HaleyMBrown.com, to showcase my photo and video work and provide an official way of contacting me, since now I have a new business email address (haley@haleymbrown.com) through the website. The website has been live since summer, but I haven’t made it known through this blog yet, so I thought now is a great time to share. It’s very visual, very media and I like it. Teal, turquoise and red are my favorite colors and I used an image that incorporated those colors from the background of a teleprompter that I had photographed on a prior shoot. I thought this photo represents what I do professionally very well: photography, video, teleprompting, production, all of that and then some. I have craved a new camera for quite some time now, especially since I’m a videographer and editor at my job. Since I work on high quality equipment at my job, I thought I should also invest and incorporate comparable gear into my freelance/hobby life as well, which will benefit me in the long run anyways. I felt like I pushed my older camera’s functions to many extremes, and it was starting to limit what I wanted to do such as more low-light and night photography, as well as time-lapses and VIDEO! Right before 2013 ended, Lorne, who I work with for Perfect Cut Productions, offered me a great deal on his Canon 7D + 40mm f2.8 pancake lens + accessories and I felt like the deal was too good to pass up, even though it was all of a sudden and right after Christmas. It was time to upgrade my equipment. And fun fact, I’ve actually used this camera many times on set with his crew so I knew it was in good hands prior to me buying it which tends to be a fear when buying (gently) used gear. So the deal worked, and now I’m able to offer photo and video services at an even higher quality than before! Plus, it’s a new toy for me and I’m eager to work on new projects, of course. Lastly, to round out my media upgrades, I unveil the new blog template that I just recently changed. To me, this layout feels fresh and bright and coordinates well with my website. Some of the previous blog posts may not be formatted well with the new layout, since I designed the original posts to work well with the former layout, but I’m doing my best to update those. I get to figure out how best to display my images within posts and what works well with my new layout. If you find any bugs with my blog or my website feel free to email me or drop a reply on here; I’m pretty quick about finding the solution. My tech life is always a work in progress, which reflects how much media shifts and evolves over time, but it’s something you can always use to improve your skills, challenge yourself and achieve creative results, which keeps media exciting! My New Year’s Resolution? To take more photos and video! I know that later this month, I will help out on set of a featurette produced by Tugboat Pictures, and I also have a couple of photo sessions in mind for portraits/headshots. So I look forward to shooting more and in turn posting about my experiences and projects, accompanied with photos from my new camera! Thanks for keeping up to date with my work. Peter faces the smoke monsters in Gobinon. In November, my co-worker and friend Byron Wolter asked me to help out on set of his independent feature film, Gobinon. I knew that the film had been a production-in-progress for over a year. Byron even joked to me about how he has used up almost every resource in town to complete the project. Byron wrote, directed and starred in Gobinon and I know he is treating the film like his child. He is caring and tending to it over a long time while undergoing the hardships and pressures of producing an independent film. Seeing that his film is really important to him, I wanted to help his production come to a close by assisting with camera, lighting and general production labor. Just a few more action scenes needed shot for Byron’s film. These scenes alluded to the mysterious sci-fi movie that Byron had described to me before, shots where his character, Peter, has dream-like episodes where he portrays a janitor chased by smoke monsters. 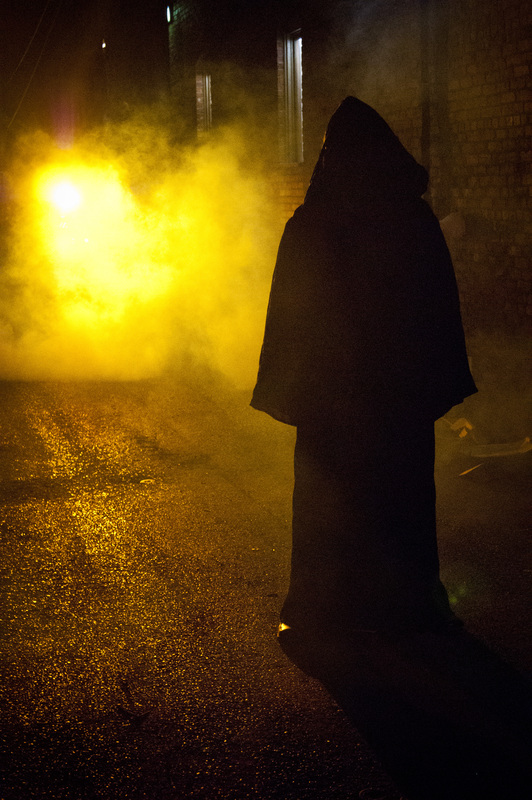 On the first night of shooting the last shots for the film, the smoke monsters chased Peter across rooftops. The temperature at night dropped really low and we had to shoot the rooftop scenes in harsh, biting winds. The crew persevered and kept working through the cold as we got the needed shots. Byron had wide jumps to clear from structure to structure on the roof. We got to incorporate the given architectural elements into the scene, such as Byron running through these big, pyramid-shaped skylights jutting upwards from the roof, which added unique visual interest and light. He also had to run and abruptly stop at roof edges and peer over them while staying balanced and cautious, which is unnerving at four to five stories high off of the ground. 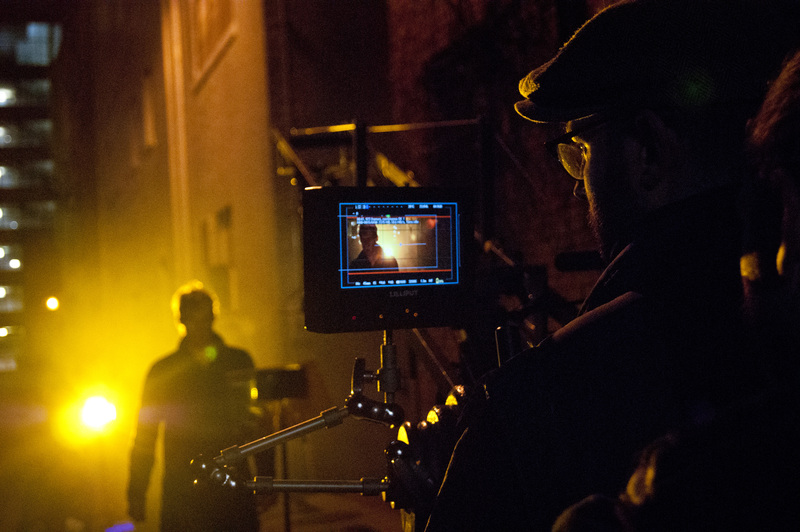 Matthew Levandoski, Director of Photography. Thomas Tiggleman as a smoke monster. On the second evening and after a few takes of a continuous shot of Byron running through the town square, we condensed to shooting in a tight alleyway. We knocked out shot after shot with ease, as it was a closely shot, stare-down moment between Byron and smoke monsters. I had more time to shoot production stills while we kept filming, as set up time for each shot was minimal. Later that night, we wrapped the film. Byron had felt very bittersweet about this, since it was a film he was shooting for over a year but it was finally coming to a close—the beginning of the end of the Gobinon journey. Recently, I was able to see a rough cut of the film, and I discovered it was layered with more mystery and ambiguity than I had imagined, and was way different from what I had thought. From what I interpreted from this edit—and without spoiling in detail—the dream sequences that Peter experienced shaped his graphic novel as well as complemented the life’s work of his significant other, Rachel, but Peter doesn’t piece this together until the end. Yes, that’s right, it’s also a love story of these two characters, a love story paralleled with the subject of Rachel’s work: the evolution of the species of fish called the Gobinon. It’s almost no wonder that the quote, “You may change direction, but your heart keeps its bearing,” is central to this film through its story and in its characters and writer. Now with the production wrapped, Byron can focus on editing and completing the film. He anticipates the night of the big premiere in town, knowing it will feel bittersweet to see the filmmaking process end for this story but remaining hopeful about the future of Gobinon and the film festivals he plans to enter with it. For him to finish the film and submit it to festivals is a huge accomplishment, and I wish him the best of luck saving the world with Gobinon. Gobinon Official Trailer from ByronWolter on Vimeo. Do the Dew. Do the Dream. Courtesy of Travis Mintier, Photographer. Have you ever wanted to ride a BMX bike down a slip and slide, hit a ramp, launch into the air, do a flip, and land in a 12 ft. deep pool? Did you not realize you wanted to do that until just now? 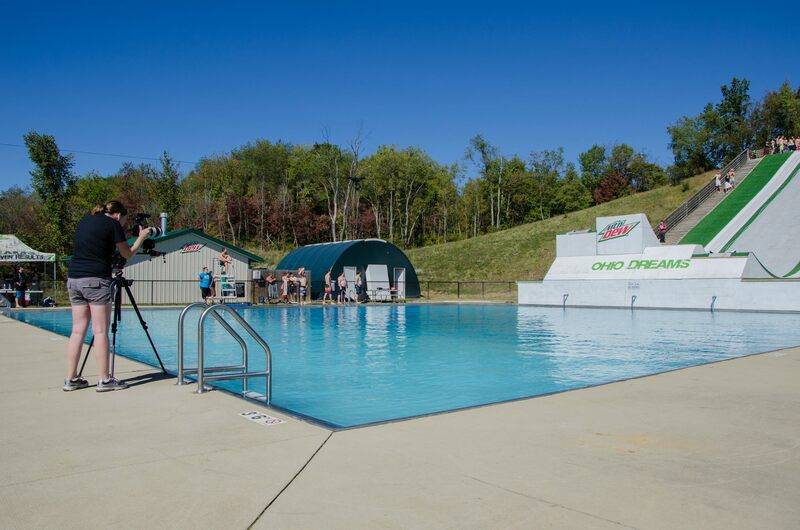 On September 27, I got to film that stunt alongside Devin “Super Tramp” Graham and Parker Walbeck at Ohio Dreams Action Sports Camp for Mountain Dew. For over a year, I have followed Devin Super Tramp on Facebook, Twitter and Instagram because I’m always impressed with the videos he pumps out every week on YouTube. From ziplining/highlining/rope swinging from canyons, to videogame reenactments, to human catapults in the mountains, to snowball fights, to flyboarding, to luging through city water systems, to playing with puppies, the Super Tramp videos are creative, fun, captivating and blood-pumping. They feel very personal yet also like they’re just beyond the audience’s reach. The videos were shot in Tahiti, Hawaii, Utah, Los Angeles, Africa, Maldives, etc. and viewers dream of being on these shoots. They enjoy the virtual experience through YouTube just as much as the people shown in the videos. If you’re lucky, Devin and his crew may travel to a location near you, blast it on social media for all to come, and you’ll be able to take part in his adventurous world of YouTube videos that you’ve dreamed about. 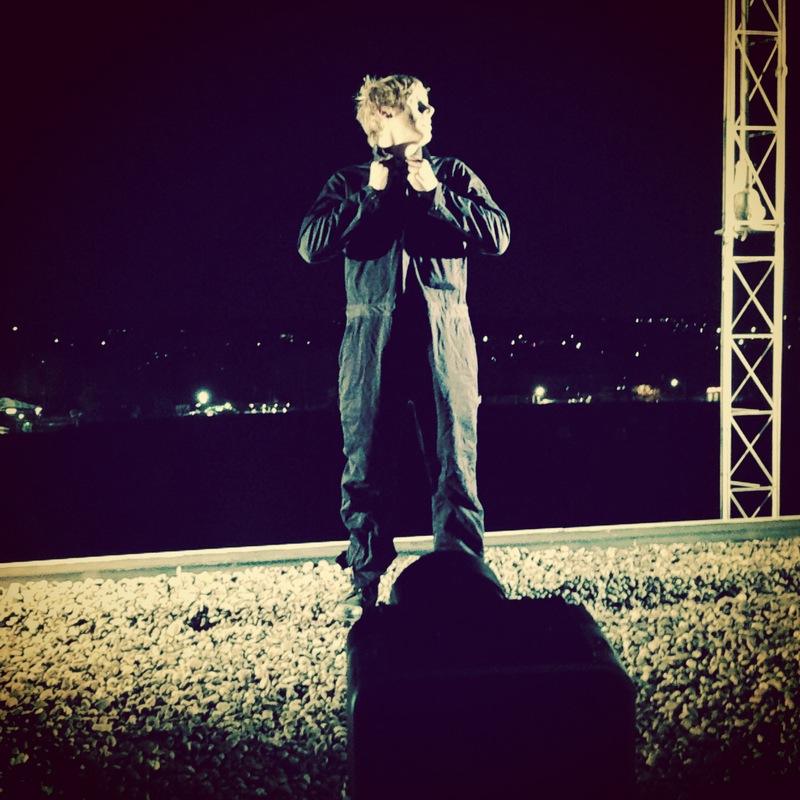 I was fortunate enough to get this chance, except I wanted to help create this experience behind a camera and be on his set, which is more of my dream than actually doing the stunts in front of the camera. That dream became a reality for me, but I didn’t know my dream would end up being in Ohio. With only knowing the day before that I would help him shoot, I had gotten in an hour of sleep and was on my five-hour road trip to Butler, Ohio at 4:00 a.m. I don’t remember the last time I was on the road that early, but I would guess to catch a flight. I had never been to Ohio, so I was eager to see that Butler was in a hilly section of Ohio, much like Bloomington is in Indiana. My boyfriend, Travis, took it upon himself to drive me to and from the shoot, so I could get more sleep and be a bit more rested for a day’s worth of shooting. (The fact that he’s a big Super Tramp supporter probably influenced his decision as well.) The sun rose as we passed through Columbus. By the time we got to Butler, it was a clear, bright day but a bit chilly. Nestled into the hills and gleaming from the sun, the white launch ramp could be seen from the road. It sat behind the still, blue swimming pool that would soon be disrupted from thrill-seeking slippers, sliders and divers. When I arrived, I got to meet Devin, Parker, Creighton and the rest of the Super Tramp and Ohio Dreams crews. The idea for this video actually came from a fan, when Devin publicized his Mountain Dew Road Trip tour information and location callout contest; a road trip for the fans, by the fans, if you will. I scouted the pool and slip and slide areas, equipped up, and filmed the entire day under the sun on this last Friday in September. A bunch of people came from all over the Ohio area to bellyflop in bikinis and cannonball in costumes. It was pretty thrilling to be a part of this experience and film this adventure, both of which I am grateful for. I had a lot of fun meeting people, making connections and of course shooting some visuals especially since it’s for a high-caliber YouTuber such as Devin, whom I admire greatly for not only filming but directing and producing these shoots as well, and of course for his business and marketing skills. And Parker, for his equally awesome camera work and his crazy-cool and hardworking editing. Not to mention Creighton, for his super friendliness and spirit, as well as his cable and rope work (even if sometimes it’s not feasible to rig up in time due to whatever reason). I’m so glad something this fun to shoot came to the Midwest and I can’t thank you guys enough for having me help film it and I’m glad you used my shots! The video turned out amazing, and I’m always free to lend a hand, a camera, a battery, a slider, a lens cloth, a towel to dry off equipment with, etc., etc… Hopefully I’ll see you all again in the near future! An Indiana girl can only dream, again. One Sunday in August, I browsed through Instagram and saw that my friend had loaded his car up for his vacation. I knew he had this trip planned, but I didn’t realize he was going solo, just to take photos of mountains and night skies. I didn’t have any shoots or obligations for the week, so I took advantage of this opportunity, with his permission. That night, I packed my bags and left at seven in the morning to meet up with him in Madison, Indiana to travel with him to the Smoky Mountains of Tennessee. How refreshing it was to go somewhere I have not been, on this trip that was already planned out, just to go photograph mountains, skies and whatever adventure we decided to seek out. It honestly could not have panned out any better for us. We drove through Kentucky and Tennessee and I was sight-seeing the whole way down and back, taking in the landscape. We stayed in Pigeon Forge but hardly spent any time there; we hiked in the mountains for the majority of our time but explored Gatlinburg and Pigeon Forge tourist attractions at night. We went to a couple of shops just to browse, and the only official souvenir we bought were pressed pennies that you crank and press by yourself. Our other souvenirs were more random but personal findings from along the trip, as well as a bunch of photos. We were fortunate enough to photograph a black bear and three cubs, lightning from a nearby thunderstorm, butterflies, trails, horizons, shooting stars at night and the “smoke” of the mountains –the dense fog. When it’s all said and done, even though I do photography/videography for a living, it doesn’t feel like “work” even when I’m on vacation. I still love capturing memories with beautiful imagery and feel lucky that this is what I do anyways as my job. I could go on some more about my vacation but will keep this simple, and filled with photos. If you have any questions or comments about my trip and want to know more, feel free to ask! A few more of my photos (not Albert’s) can also be found on my Flickr account. An article in The Herald-Times back in June reported that the U.S.S. 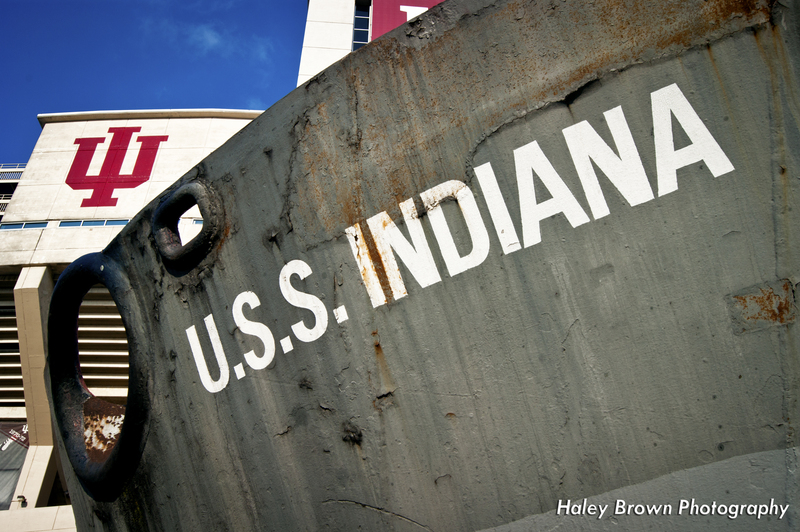 Indiana prow would reside at the Indiana University Memorial Stadium in the near future and join its mast and guns that currently live there. The prow of the U.S.S. Indiana was delivered to the stadium on Thursday, July 18, 2013. U.S.S. Indiana in front of Memorial Stadium. The inside of the prow’s shell. Before Thursday, the prow sat in a restaurant parking lot in California. Now, it sits in the stadium’s parking lot in Indiana awaiting restoration, preservation, parts added onto it, and its final placement amongst the mast and guns. It arrived around 4:00 p.m. on the back of a hauling trailer, and nearly all of the university student’s cars were gone. Nearing the end of business hours, there had yet to be any fanfare that I noticed from my porch outside my apartment. I planned to capture photos of it after my dinner plans and during sunset. The evening was hot but the light was great during this golden hour. Being an IU alum and living by the stadium gives you plenty of nostalgic, historic photo ops that are hard to pass up. This one was special, because it was still early in the scope of its new life at IU. During the time I took photos, only a couple of people drove by to take a look, a quick snapshot, and drove away. Bicyclists passed by on their routes elsewhere. For the most part, its arrival went unnoticed. The prow awaited for the new care that IU would put into it as they include it as part of a memorial and a symbol. But before all of that happens, I was able to capture how it looked at the very beginning of its transition. 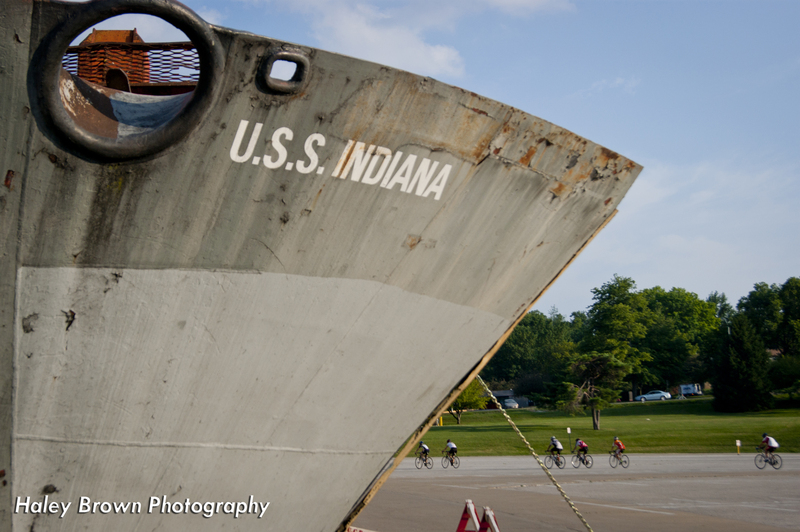 Bicyclists are an icon to IU, much like the U.S.S. Indiana. In honor of August 24 being the first “Flavors of 4th Street” international food festival that I will be blogging about, I am posting some salivating photos from this year’s “Taste of Bloomington,” as a teaser.